What is it about comfort food that we love? Why does macaroni and cheese taste better than cold cereal for breakfast? Why do we salivate at the thought of eating mashed potatoes or baked potatoes slathered in butter, bacon, and sour cream? How come a grilled cheese sandwich or a piece of crispy fried chicken is irresistible? What is it about a gooey slice of pizza that beckons us? And what happens to these desires when we do not eat meat or dairy? Cookbook authors Bianca Haun and Sascha Naderer have come to the rescue for the plant-based eater. 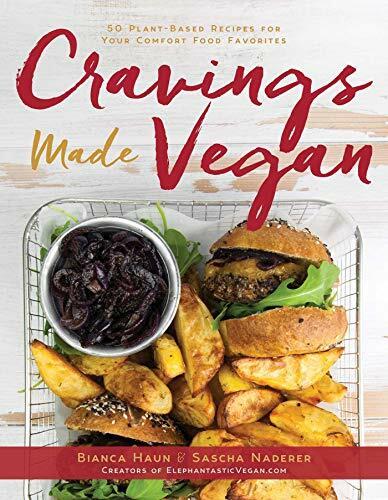 In their latest vegan recipe compilation, Cravings Made Vegan, the reader is transported into a vegan world of food decadence. The recipes should not be mistaken for healthful food options, but like all comfort foods they satisfy an emotional craving from within. People eat for a variety of reasons. They might prefer foods from their childhood cooked by a beloved grandma. We eat to satisfy hunger, but we also eat for a variety of emotional reasons such as stress, anger, depression, and even happiness. Comforting foods provide plenty of fat, sugar, and salt, which are considered addictive. Haun and Naderer are not new to creating cookbooks. Their first publication The Veginner’s Cookbook aids the plant-based novice navigate the world of veganism. Their latest cookbook, Cravings Made Vegan, transforms standard recipes that satisfy cravings to the world of the vegan. Their recent concoctions allow the vegan to satisfy their most intense cravings from the non-vegan world. The cookbook is divided into two parts. Part I is a mere four and a half pages but filled with relevant information. Here one will find the ingredients to substitute to generate a vegan meal that is gratifying to one’s senses. When in doubt about locating these unusual ingredients, there is always Amazon. The authors are not shy about suggesting foreign sounding products. Kala namak, with its sulfur smell and taste, and Himalayan black salt can make tofu taste like egg salad. Cheese is one of the most comforting of foods. Vegans have recognized for a long time that the addition of nutritional yeast to any recipe creates a cheesy taste. Nuts, such as cashews, can also be turned into a ricotta-type cheese. The authors use dairy substitutes, such as coconut milk, to create whipped cream, panna cotta, and an Indian-style butter chicken. There is a plethora of plant-based alternatives in the marketplace, such as vegan butter, coconut oil and nut milks, that will help the vegan home cook bake succulent pies and crumbles. There are a multitude of options to choose from when recreating favorite, indulgent comfort foods. The baked goods offered in the cookbook are sweet, golden, and rich. Part II is where the recipes begin. Breakfast becomes so much more than a bowl of oatmeal or a smoothie. A chickpea flour omelet filled with mushrooms and tomatoes is delicious and savory. The addition of turmeric also makes this recipe anti-inflammatory and a more healthful option. For the reader who loves a sweet breakfast there are chocolate chip pancakes. Just switch out almond milk for the dairy and the fluffiest pancakes are served. The vegan kitchen is aromatic. Many of the recipes in this cookbook require some effort and work. Lunch becomes much more than a salad tossed with chickpeas. Hotdogs require working with vital wheat gluten. The mushroom burger is not a grilled portobello mushroom in a bun but an actual mixture of mushrooms and oats. Add French fries and lunch is served. Walnuts are transformed into taco meat. Desserts consist of soft-baked chocolate cookies with an easy and straightforward list of ingredients. Chubby chimp ice cream is a breeze to create with frozen bananas. If that doesn’t satisfy the sweet tooth than there are options such as deep-fried coconut donuts.